Over at the National Humanities Center I’ve discussed the Agni Pariksha segment of Nina Paley’s Sita Sings the Blues. I want to put that segment in context, both in terms of the visual styles Paley developed for the film, and its place in the story. 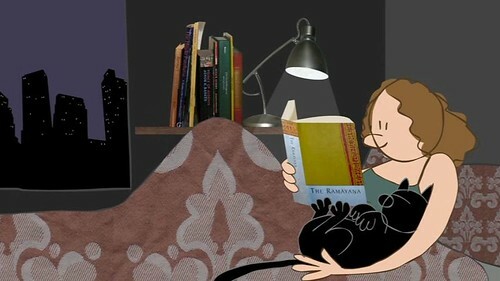 As you may know, the story sets up a parallel between an incident in the life of Nina Paley, a cartoonist depicted in the film as, well, Nina, and the story of Rama and Sita in the Ramayana. Paley’s husband dumped her while she was on a business trip in New York City. It is that event, and its emotional aftermath, that is set in parallel with Rama’s decision to discard his wife, Sita, for the sake of public appearances: It just wouldn’t do for a monarch to keep his wife after she’d slept in another man’s house, even if that man had forcefully abducted her and she’d remained faithful. The whole film is roughly 82 minutes long, including the opening titles and credits and the end credits. Paley runs the two stories in parallel up to the intermission, at roughly 48 minutes into the film, which is a bit over half-way through, and uses four distinct visual styles (see next section). The Agni Pariksha segment is three minutes long, running from 51:40 to 54:40, and is in a different visual style. After the Agni Pariksha, things change. My goal is to set up styles, sounds, and stories that contrast initially, but merge, or at least interrelate, by the end. As the boundaries between my story and Sita's dissolve over the course of the film, so shall the distinctions between the visual styles and techniques I've established. 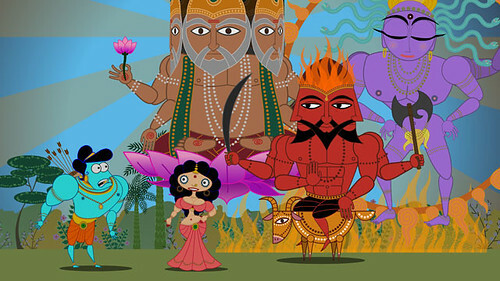 For example, the flat cartoony musical "Sita" may saunter into same frame as a rough animated journal sketch. Sound will reinforce this merging, as Annette Hanshaw jazz creeps into Indian Classical music and vice-versa. While things didn’t quite work out as Paley had envisioned them (personal communication), that’s more or less what happened, and the Agni Pariksha sequence is the film’s turning point. 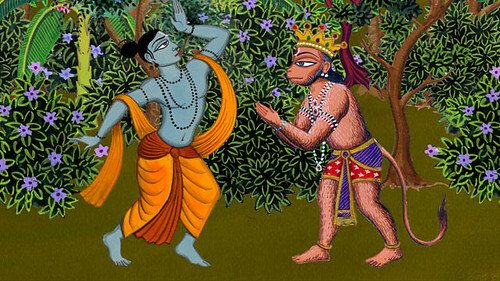 Much of the story is told through use of paintings which Paley modeled on Indian Miniatures. The animation in these segments is deliberately minimal. Character’s bodies are kept rigid and moved over the background in the manner of a child playing with paper cut-outs. Paley developed a highly Eclectic Style through which she presented commentary by a chorus of three interlocutors in conversation with one another. Each is represented by an Indonesian shadow puppet. As they converse, the people, places, and things they’re talking about are represented on screen by a wide variety of collaged images. The Agni Pariksha – purification by fire – comes after the intermission, which is in the Cartoon Main style, but not immediately afterward. First we have the scene where Nina gets an email from her husband informing her that he wants a divorce. That scene, of course, is in the Personal-Real style. As Nina screams, we segue to the Agni Pariksha, establishing an identity between Nina and Sita. Nina’s life has now come crashing into the events of the Ramayana. As identities co-mingle, so do previously separate visual styles. We’ve got an Indian miniature scene on the right, and an Indonesian shadow puppet on the left; notice that the puppet’s hand crosses the midline into the Indian miniature. The Ramayana is well-known in Indonesia, as it is throughout Southeast Asia, though in many different versions. A more elaborate example occurs in a sequence running from 65:00 to 66:29. In this sequence Sita’s two sons are singing a song in praise of their father, Rama, who doesn’t even know they exist. They’re living in the forest with Sita and being tutored by Valmiki (who would go on to write the oldest existing Ramayana text). The song has two kinds of verses. One kind is conventional praise – “Rama’s great, Rama’s good, Rama does what Rama should” – and the other is satirical – “Sing his love, sing his praise, Rama set his wife ablaze...” The song opens and ends with the “straight” verses, with the satirical one’s sandwiched in between. The straight verses are realized in the Indian Miniature style, while the satirical verses are realized in the Cartoon Main style. This is the only point in the film where we have that style without Sita. These are not the only places where Paley uses stylistic blending after the Agni Pariksha. Some are relatively unobtrusive, such as an interlocutor’s voice on the soundtrack along with visuals in the Indian Miniature style, while there is a relatively major example closer to the end. Sita vows to return to Mother Earth, which is represented in the Cartoon Main style. This is the first, and only, time Sita has spoken from within that style. Every other time she’s appeared in that style she does so to sing an Annett Hanshaw vocal – which she does later in the scene. My purpose here, as in my various posts about Disney’s Fantasia, is primarily to describe what happens on screen. If we want to know how movies work on and through their audience, we must know how they are constructed. If we don’t know that, it’s not clear how we can know much of anything else. 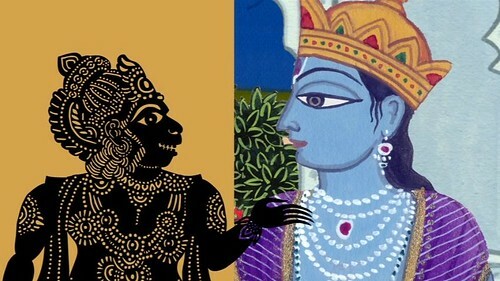 In the case of Sita Sings the Blues, Nina Paley set out to to establish a parallel between the life of a contemporary person living in one culture and the lives of divinities from another culture as depicted in an ancient text from that culture. The different visual styles state and reinforce cultural differences. Once the lives of her characters have collided in the Agni Parishka, however, Paley begins to break-down those cultural differences. She blends previously disparate visual styles. In so doing she makes a statement about common humanity in an immediate and visceral way that is quite different from abstract arguments about human nature. Whatever the force and validity of those abstract arguments, they have little chance of influencing the lives of peoples across the globe unless they are made emotionally real though art such as that Paley has generously and skillfully deployed in Sita Sings the Blues. For me, the most significant blending was having the "Hanshaw"/cartoony Sita speak with Reena Shah's voice at the end: "If I have always been true to Rama..." This is the only point in which that character design isn't singing Hanshaw. Then she's gone. For those who don't know, Reena Shah voiced Sita. She also danced Sita in the Agni Pariksha. Focus? I don't need no stinking focus!